Say the word relic and the first thought that comes to my mind is religion. Through the decades, objects have been venerated by people because of who they belonged to or what they represent. 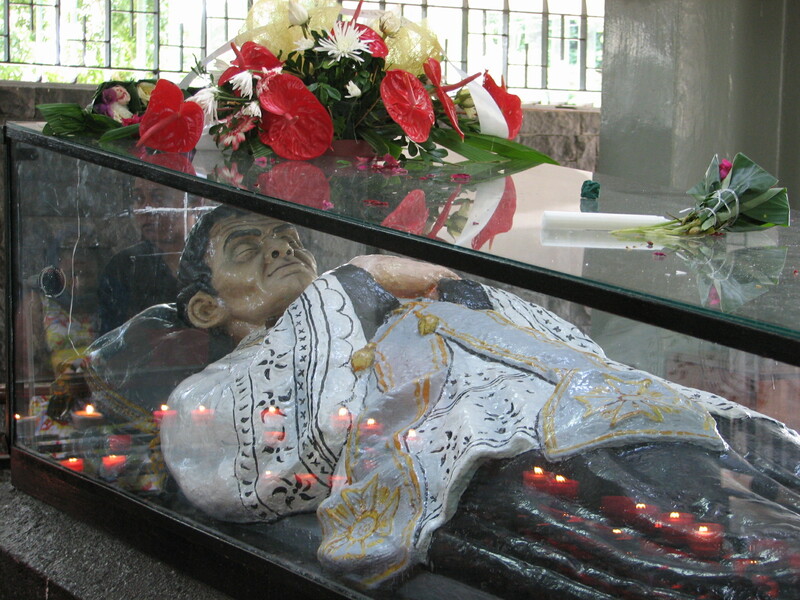 Each time I have been to Mauritius, I have visited a place where a shrine has been erected in memory of a Catholic priest, Jacques-Désiré Laval. Visitors remember the good works he did for the poor and disenfranchised during a time when not much was done to help this group of people. Modern visitors, however, are not only those from the poorest of society. Instead people from all walks of life come to this place to light a candle and say a prayer. Each time I leave the shrine, a sense of peace surrounds me and I can understand why believers visit the vault built in memory of this man and what he did. Have you seen a religious relic? It is also a tradition that has been followed by Catholics through the centuries. I think of the relics that worship peers used to pray before during the Middle Ages – things claimed to be from saints, or from Jesus himself. Nowadays, of course, people don’t believe in these things as readily as they did in the past. Indeed, there is nothing Pagan about the relic tradition. The whole Holy Grail quest was looking for a relic. The Shroud and numerous others are relics to do with the Christian faith – and not only Catholic. Thank you for these examples Colonialist. I know that if I ever had the chance to see the shroud, I would do so – even though I am a learned, modern person. There is something to be said about seeing something that was touched by a person you admire. In this busy world that we live in, it is certainly a treat to find a small haven of it. I’m with you Colline. 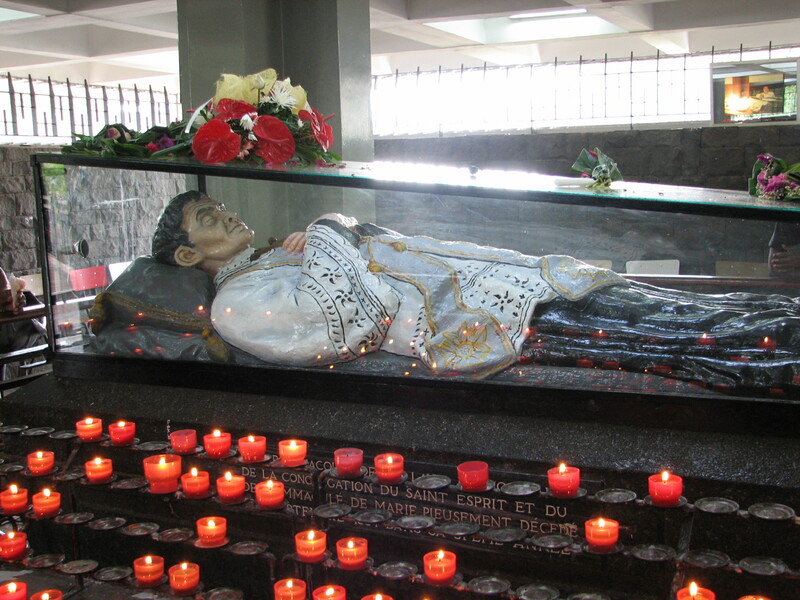 Visiting the relics of saints give us the sense of peace and love. Even if a person doesn’t believe, I think he/she would be able to sense the tranquillity of the place. Yes, I’ve seen quite a few such religious relics, Colline. One not so religious, was Mau Tse-Tung’s embalmed body in his crystal coffin in Beijing. That would be interesting to visit. Were there many local people about when you went to see the shrine? Yes there were many Chinese people lining up there, to lay flowers at the shrine. Do you have any pictures Jo? I would love to see them. I’ll have a look back, Colline, but Michael used to take all the photos in the days when we went to Greece. It’ll be nearly 20 years since we were last there! I’ve never seen one, thanks for sharing. I had never seen one either until I visited this shrine in Mauritius. I’ve never been to a shrine like that. The feeling must be intense in such places. The feelings of devotion and veneration must uplift the spirit of everyone who visits. It is very peaceful inside and every time I have visited, there have been people inside praying. Thanks for this post, Colline. I will look him up. Thank you Sonel. He was a man who did a lot of good for a large group of people. A relic that inspires faith, renews faith, heals one’s faith. Thanks for sharing an inspiring post. Life is a journey of storms, calmness and all things in between. In all, we need relics that symbolize our faith, hope and dreams. Happy Summer! As you say, these relics are a symbol of what we believe in. Visiting Pere Laval certainly reminds me that one can work for the good of others, and do it selflessly. I recall and actually have a similar photograph as yours, mine was taken in the Cathedral in Chile. Also a shrine to Padre Pio. It is interesting that these are all found in third world countries where religion is still an important part of people’s lives. Lighting a candle is such a beautiful way to honour someones memory and the work they did. I love lighting a candle for those I loved and will always remember. I agree. And the physical act helps to make your memory even more real.